It's Mardi Gras, time of boundless celebration. Get purple and green chocolate coins as well as leis and other party favors. For Valentine's or other heartfelt occasion fill our heart shaped box with Dove Mini Squares. Or choose a different fill. 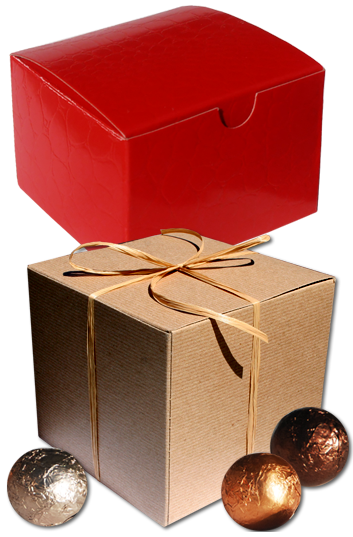 We have gift boxes: glossy red, glossy white, matte, eco-friendly cube boxes and more. 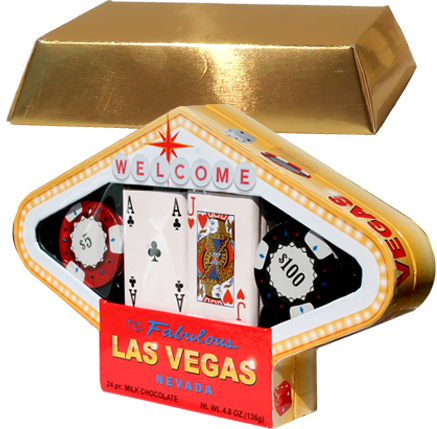 The "Welcome Box" is a presentation box in the shape of the famous Las Vegas sign, and it is filled with rich milk chocolate cards and pokerchips. ...like our solid chocolate cars, made from smooth German chocolate. World class truffles - lots of varieties and flavors like Amaretto, Raspberry, Hazelnut, Orange, Champagne, Chocolate, Coffee, Rum, Mint, Black Forest, Irish Cream, Toasted Coconut, Butter Pecan, Tiramisu, Cappuccino, and Caramel. Our premium truffles are made fresh upon ordering, using the best heavy cream from Vermont cows, and gently blending it into the truffle's ganache center. The result is the tastiest, creamiest truffle around! These truffles make for a wonderful customer appreciation or holiday gift. Pictured right are several styles and flavors of our Premium Dessert Size Gourmet Truffles. They are 1 ounce large each, and we package them in an attractive 4-pack gift box. This gold gift box can be foil-stamped in a single color, or we can add a full color label to the top of the gift box. 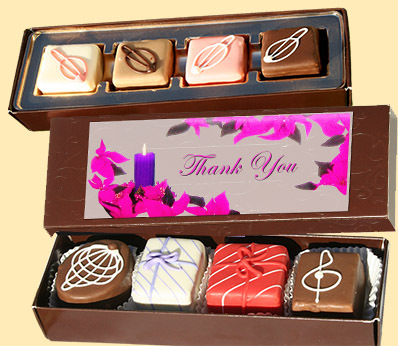 Gift boxes can include any combination of different truffles. 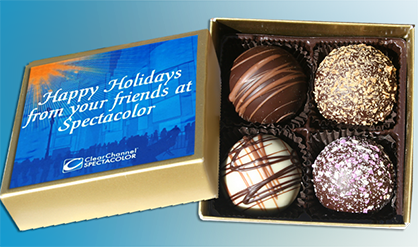 Bite-size truffles weigh in at 1/2 to 3/4 ounce and can be packaged in slide-out window gift boxes - or in any of our bulk containers, when wrapped up in colorful foils. to the left are bite-size twist and mini-twist truffles. For a complete list of truffles including our colorful Artisan truffles, please click here. ... a fantastic gourmet experience for all the senses... Not only do these tiny cakes look luxurious, their taste is simply superb. Classy and compact - miniature perfections, and a great alternative to giving chocolate, our luxurious yet affordable petit fours are hand-made locally to order and come in many seasonal and color themes. Depicted left is our Pastel Package series. Cross sections of Petit Fours reveal their delicious makeup of of almond butter cake filled with layers of truffle, fruit or butter cream. The outer shell of beautifully decorated premium chocolate seals in flavor and freshness. We also feature other colorful giftbox-themed Petit Fours such as these bright Birthday Packages, as well as our popular fall season's Harvest series (please view far left). For a slightly smaller but equally delicious indulgence we offer our Demitasse Selections in a variety of flavors. To see a list of colors and flavors, click here. 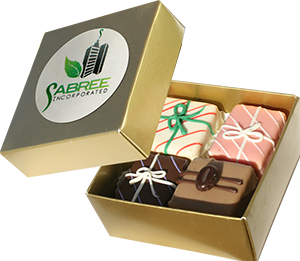 Let us customize these exquisite little cakes with your logo by packaging anywhere from two to four to multiples into deluxe presentation boxes. We offer slide-out boxes with windows, folding gold boxes with snug lids, and other gift pack presentation solutions suited to your budget. 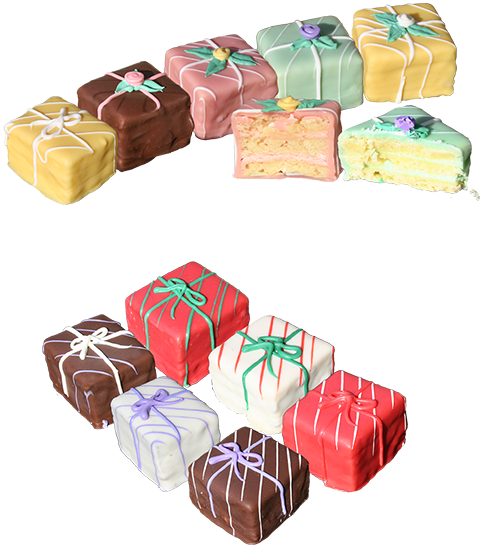 View all Petit Four selections and find out how we can customize them with your brand!